​​Discover our chocolates in shapes of the wonderful world of Asterix and Obelix to end the holidays happily. Buy now! 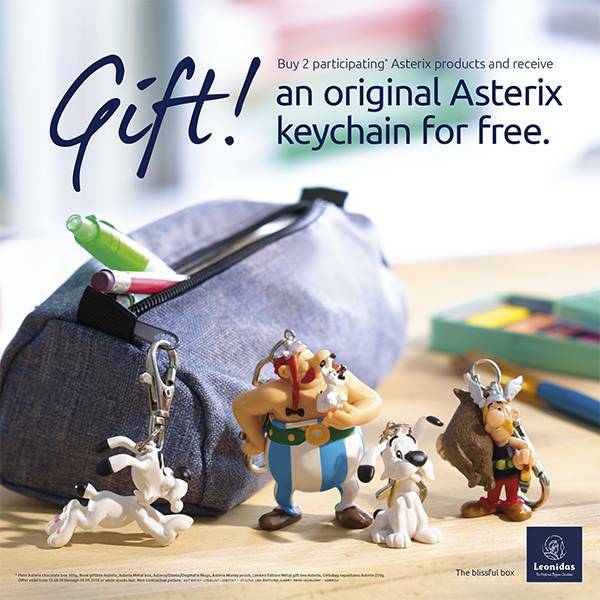 With our promo you get an authentic Asterix key ring when you buy any 2 products in the Asterix range! A must for going back to school. Asterix’s blond moustache, Dogmatix’s white fur and Obelix’s red plaits, all is present! Discover our delicious chocolates in the shape of your favourite Gauls. But which are you going to eat first? These delicious dark and milk chocolate Asterix Napolitains, a joy for epicures and for others. The original wrappers will delight collectors! A MONEY BAG FULL OF GOLD COINS! These delicious chocolate sesterces with the faces of Asterix, Obelix and Dogmatix are a treat for the taste buds! What are you waiting for? Try them! Buy now! With our promo you get an authentic Asterix key ring when you buy any 2 products in the Asterix range ! A must for going back to school. Offer valid from 13/08/2018 through 09/09/2018, or while stocks last.